You are here: Home / Passages / James / 03 James 1:9-18 Who is better off: the rich or the poor? James opened his letter with the admonition to rejoice in trials and hardships because they have a purpose. That purpose is to mature and strengthen our faith. 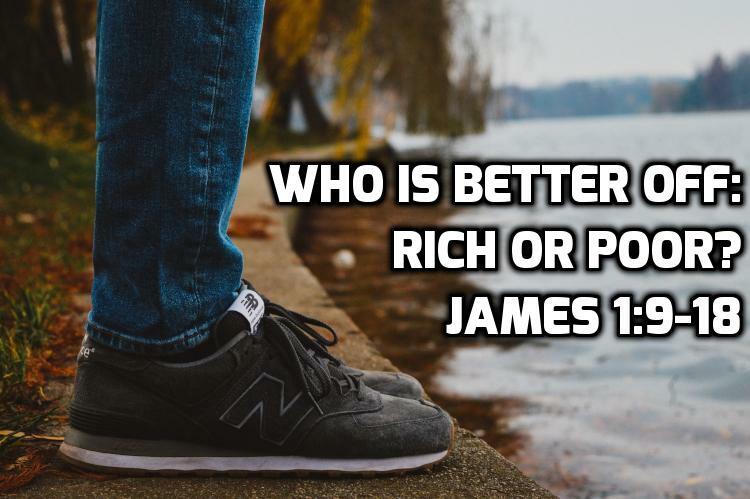 In 1:9-18, James raises a new question as an example of how understanding the gospel changes your perspective: Who is really better off: the rich unbeliever or the poor unbeliever? Ultimately, the humble poor believer will be exalted and receive the “crown of life.” The rich unbeliever will be humiliated, as his riches fade like a field of wildflowers. It may seem the other way around right now, but if you understand the gospel, you understand that the riches of this world do not last. Consider the beauty of a field of wildflowers. While a field of wildflowers is very beautiful, if you wait long enough, it will be wither and fade. The same thing is true for the riches the unbeliever is counting on. Riches are truly attractive. Money solves a lot of problems in this life. But in time, the riches are not going to last. The fact is the rich unbeliever has thrown away that which will last for that will pass away. He will be reduced to humiliation on the day of judgment. So if you believe in and understand the gospel, you find nothing to envy about the rich unbeliever. By contrast, those who persevere in faith will inherit everything worth having. Who is truly fortunate? The person who remains steadfast under trial. Because the ones who have faith will inherit the kingdom of God, and they will be truly blessed. In verses 9-11, who are the “lowly” and who are the “rich”? What temptations do you think each group would face? How do you think James would encourage them? Which group would James put you in? Do you think there’s a difference between the trials of verses 1-11 and the temptations in verses 12-18? Why? According to James, what is God’s role in temptation? How does that fit with Jesus’ teaching us to pray, “Lead us not into temptation but deliver us from evil”? What do you think it means to be deceived? And how do we avoid it? How do the “good gifts” (vs 17) relate to “being deceived” (vs 16)? How do “good gifts” protect us from being deceived? What is more troubling to you: self-deception or deception from outside sources? Why? Previous: 02 James 1:1-8 – Why does God test our faith?